Create & recreate your style with a natural look and shine, a contemporary grooming pomade. 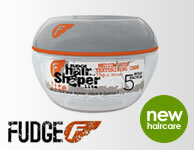 Adds texture & definition and smoothes & defrizzes. Put small amount between palms and rub together. Work evenly and thoroughly into dry or towel dry hair. Mould pliable hair into required style. Check out the fibrous nature of the product by putting small amount between fingers and touching fingers together a number of times observing the fibre strands!